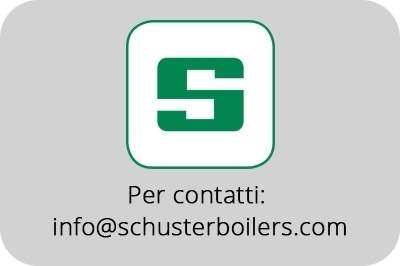 SCHUSTER, historical German brand, proposes a complete technological range of products, boasting at the same time a MADE IN ITALY production. - DOMESTIC RANGE: condensing and traditional, wall hung and floor standing boilers and thermal unit until 35 kW. From 2015 BIOMASS: wood logs and pellet boilers, pellet hydrostove and warm air pellet stoves, storage tanks. - PROFESSIONAL RANGE: condensing and traditional, wall hung and floor standing boilers and thermal unit until 6.000 kW. - INDUSTRIAL RANGE: hot water or diathermic oil fired generators until 21.600 kg/h of power, steam generators, superheated water boilers, tank for condensate collection, blow-down cooler vessel and daerators. Schuster is a registered trademark of Unical AG S.p.A.
Schuster wants to be synonym of technology, safety and simplicity for all those who, in the world, want quality products and the concrete certainty of a well-considered choice.